During our flood, I was expelled from my game room in the basement which saw the worst of the flooding. Thankfully, we also have an Xbox One in the family room on the main floor so, while I was keeping an eye on kittens during the night, I decided to replay The Darkness. The Darkness is one of my favourite 360 titles, though this is partially due to the game never being ported to the PC and consoles are the only place to play it. Released only on the 360 and PS3, PC users missed out on one of Starbreeze’s final masterpieces before the company fractured and the major talent left to form MachineGames (who make the current yummy Wolfenstein franchise). The Xbox One’s backwards compatibility of The Darkness sees some performance improvements and runs almost flawlessly at 30fps. The Xbox 360 version (running on a 360) occasionally dipped below 20fps and the PS3 version had even more frequent framerate dips and the added annoyance of nasty jaggies everywhere. This is the original trailer for Riddick, the game was later remastered with higher resolution textures for the Assault on Dark Athena release. If you played The Chronicles of Riddick: Escape from Butcher Bay (and if you didn’t play it...shame on you) then you’d be familiar with the Starbreeze Engine that powered most of their games up to, and including, EA’s Syndicate reboot. I love this engine and The Chronicles of Riddick: Escape from Butcher Bay is still a top-ten-favourite-all-time game for me. The Darkness is also an amazing use of this versatile engine, but its trouble development shows a small lack of the spit and polish that made Riddick such a perfect game. For those unfamiliar with the comic book which was the source for The Darkness, think Venom meets The Exorcist. Really, The Darkness video game is the best Spawn game ever made that has nothing to do with Spawn. The Darkness is a fantastic first-person shooter/stealth game with a hub-based world full of interesting characters. It all still works extremely well and when combined with Starbreeze’s fantastic attention to detail and gloomy atmosphere, there is lots to love here. Plus, The Darkness itself is voiced by Mike Patton (of Faith No More fame) and I think it is one of the best vocal performances in gaming. My only real complaint with the game is the slow walking pace. There is no running in The Darkness and Jackie’s standard movement speed is just above a shuffle. This isn’t too much of an issue unless you are backtracking through areas you’ve already cleaned out, but I wouldn’t have said no to a run button. The other complaints I have are minor. There are no recording options for the game on the Xbox One (hence my poached screenshots). I am assuming it is a licensing issue that prevents the taking of screenshots or the recording of gameplay. The 30fps cap is annoying as well, but it is hard to be too mad at the framerate when I now have this amazing title preserved on the Xbox One. Still, no PC port really hurts. 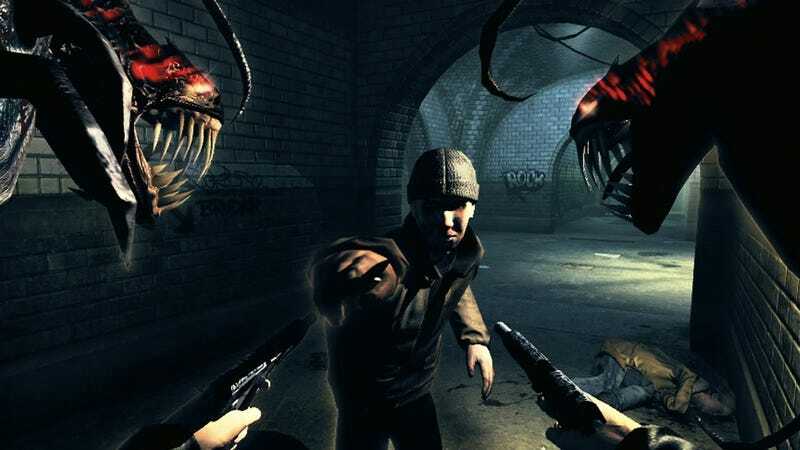 The Darkness is always one of those games that comes to the top of my mind when talking about games I wish were ported to PC. The Darkness is well worth a look on the Xbox One. It might be ageing a little, but the original Starbreeze team should go down in history for making some of the best narrative-driven first-person shooters out there. I’m looking forward to a relaxing weekend with no flooding and returning to Skyrim VR now that my game room is reassembled. The flooding also took me away from the gaming plans I had with my kid over his March Break, so I’m hoping we can get in some Breath Of The Wild this weekend as well.